On November 11, the Armistice. 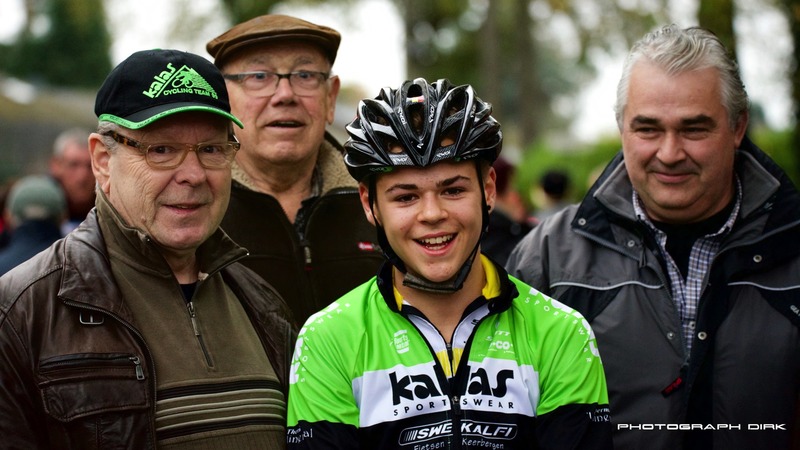 However, on November 11 also found to Heppen place Championship of Flanders. 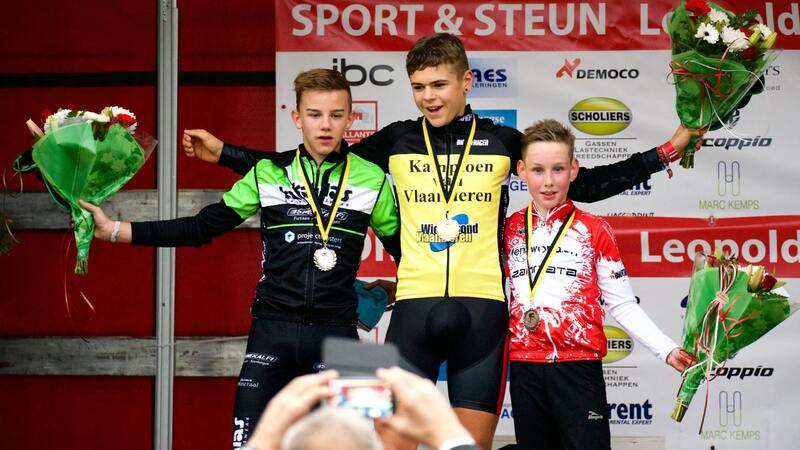 This is not the first time that they organize this championship because two years ago Dante got here his first Champion of Flanders sweater. 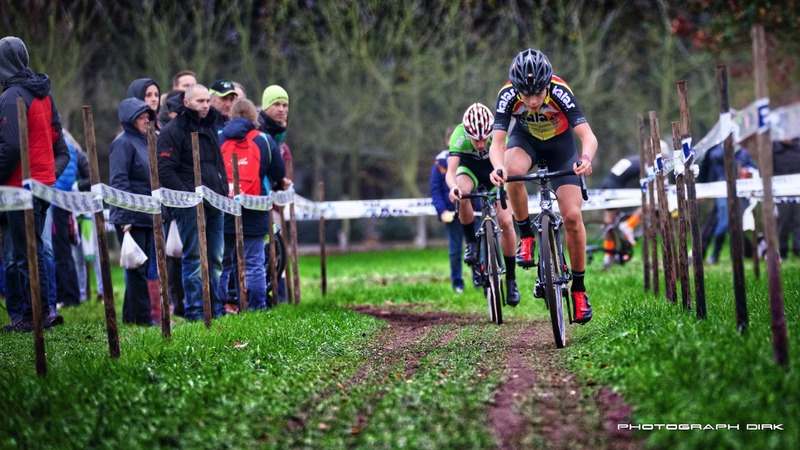 On the same site was thus fought for the beautiful yellow / black jersey, but this year the track was different, more forest passages, and on the corn field was fine now strewn grass, and they had obviously bars ….. trunks feature . Dante left as big favorite, he would easily win many believe was the question, in what round he would drive off. I was still grumbling, a game must still be driven and you can not sell the skin before the bear was shot. But everyone assumed that one place was fixed already. For 2- and 3 were some more contenders. All well and good, I also know that Dante cross this season dominates harder compared to last season, but it makes me uneasy. Because he can only lose here. We had also mobilized everybody, Bert was ready in the pit, training mate Jeffrey was the cameraman of service. Friends and family were present to give him the necessary support. The atmosphere was good. The plan was simple, go and pull firmly straight from the start and does not systematically increase the pace but pop at the beginning. Competitors their plan was already known too, right at the start Dante trying to keep his wheel. Stress is Dante noticing weird or something rare, usually he has “bad legs” before the start of the game, now his legs felt super. By that statement, I was already nervous, he goei legs …. 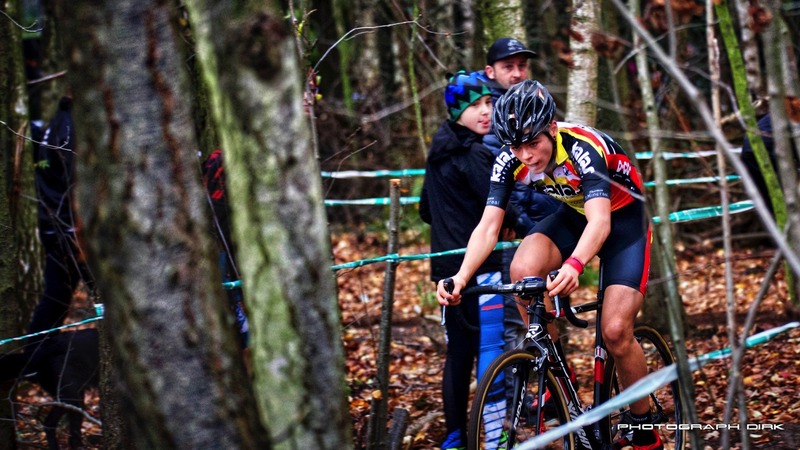 At the start, he moved like a cannonball, teammate Thibau NYs and size Flore Wienen battled right away to find a place in his wheel. Thibau sat after the first strip of wood in Dante his wheel, and kept pace uphold. Flore had to make a hole, and this hole was deepened in the wooded strips. The first passage to the beams was immediately fatal to Flore, he tried to drive to the hole and he got out of his click pedal while jumping with all its consequences, a dead smack was the result. At the start had a rival for the podium teammate Yorben Laurreysen immediately leave the peloton. Are off and chain between the gears. There were so after one lap already two candidates podium riders out. A few laps later apparently drove Orin Robins against a tree and could not continue the game, he drove at that time among the top five. As long as there was someone was continuing to draw Dante on his wheel and tugging and continue to put pressure, in this case his teammate Thibau. But the frantic pace they were now far driven away from the pursuers, led by Arne Baers. Thibeau had to fix the wheel, but could continue driving his pace. Once the hole was beaten Dante lowered the tempo and he just tried to keep the gap on his first pursuer. Place 1 and 2 was already known, but the small trail were there to be made a lot of laps and there was also quite quickly doubled. This was done without too much trouble and everyone went neatly to the side, the lapped were now removed from the game. There were 58 riders started, to place 28 Dante anyone kindly asked to step aside while. Perhaps the circle was slightly short. Dante confident won the race and was equally convincing teammate Thibau handsome 2nd. It was therefore wait the sprint for third place because there reason Lennert, Arne and teammate Ward for the bronze. Eventually Arne Baers pulled with a scorching final spurt just before the last corner the lion’s share. With this we also thank all the friends, family and supporters to descend to Heppen, hopefully you are there to Landskouter at the BK on December 6 and can act party again about doing off. But every game has to be driven, hopefully he has the same super legs today. Also thanks to all the riders who neatly they went.